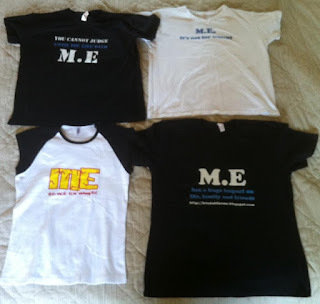 A selection of M.E Awareness t-shirts. Carmel Hillary first opened her Cafepress M.E Awareness store in support of Let's do it for ME and Invest in ME charity in November last year. Her t-shirt design "M.E. - it's not for wimps", along with a wide range of other designs, proved popular and raised funds for biomedical ME research. 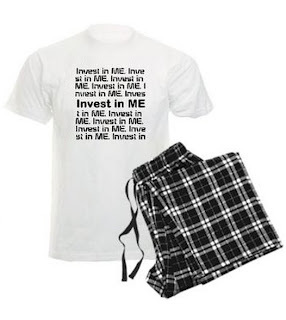 Now Carmel has opened up a second M.E Awareness store with many of the same popular designs but this time with Spreadshirt.co.uk where UK shipping costs are more favourable. The New Spreadshirt M.E Awareness Store is in addition to the first which will remain open offering customers the widest choice in available products. 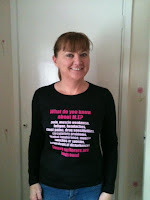 Certain products are only available through the Cafepress M.E Awareness store, this includes the pyjamas, phone covers, magnets and bumper stickers shown here - which have also proved popular and have been successful in attracting attention to our cause. Carmel's stores are also selling the Global Action International Awareness Day t-shirts for the UK, with kind permission from event organiser Joni Comstock. 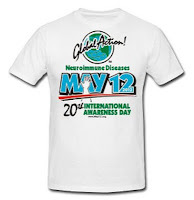 For more information on the International Awareness Day campaign or to purchase a Global Action t-shirt in the US visit the Global Action May 12th website. 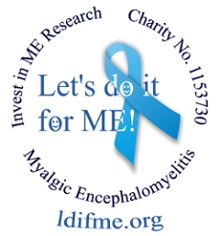 As with the official Let's do it for ME Standard Spreadshirt Shop and Designer Spreadshirt Shop (where you can re-size our designs and add your own images and slogans) all profits from both of Carmel's stores go directly to Invest in ME and towards biomedical ME research in Norwich. 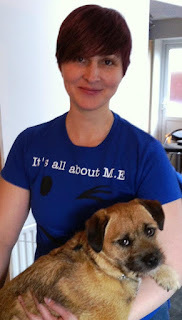 With thanks to Carmel for all her hard work in setting up and running her M.E Awareness stores despite being very unwell herself and for her support of Invest in ME charity and the Let's do it for ME campaign. - Let's do it for ME!